Trivandrum Photographers Forum ( TPF) is constituted for fruitful discussions and studies based on photography and it’s possibilities. TPF is a NGO (Reg. No: TVM/TC/545/2016) formed mainly for providing technical knowledge of our tool (Camera) for all photo enthusiasts out there. We never had an age barrier and never will. We have members from various parts of the planet and it’s no doubt that they’re pretty good at what they do. We have a Facebook group and Whatsapp group for discussion; you too can be a part of it by contacting our admin. And for your information it is totally against our ethics that sharing of any non photography related content like sexually explicit stuffs,chain messages in our group. Once you post anything mentioned above,you will be removed not only from our whatsApp group but also from TPF. You may even have to face the further consequences by law based on IT act. If you’re OK with our terms and conditions,we are privileged to have you as a part of our TPF family of shutter bugs. Feel free to share anything about photography and you are important as every other members in this forum. Sharing your knowledge in this field is very much appreciated. 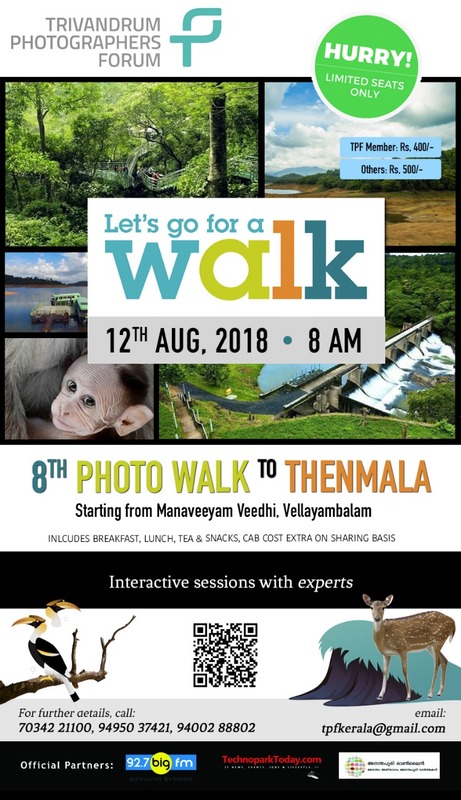 We are frequently organises events like photowalk and workshops in Kerala. Trivandrum Photographers Forum (TPF) conducted their 6th Photo Walk on 08-04-2018 at Veli Tourist Village, Trivandrum. Photo Walk inaugurated by Sri, V. Santharam, Former DGP and the session was started with a small session of Landscape Photography class by BIJU JOSWIN. It was a great success and 45 Participants were enjoyed their PhtoWalk. Experts shared their knowledge with each other.